Built within the footprint of an earlier home to minimize impact on its wooded site, this new beach cottage reflects the character of the older 1930’s-era cottages which surround it. The plan is divided into three sections, starting with a screen porch featuring an exterior fireplace. The front door opens onto a two-story family room at the center of the first floor. The kitchen, dining room and a bedroom suite occupy the rear. Upstairs, two ‘bunkrooms’, one at each end of the cottage, are connected by a bridge overlooking the family room. The simple gambrel roof form, punctuated by shed dormers, helps minimize the volume of the house and mirrors the modest scale of the interior spaces. The stuccoed main section of the house is buttressed by two shed-roofed extensions clad in cedar board and batten siding. 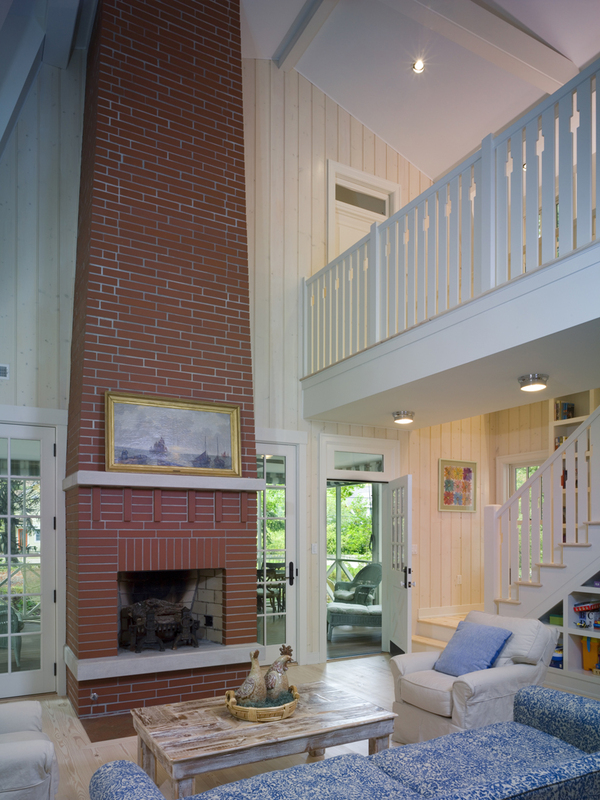 The interiors are finished in painted pine V-groove paneling and wide plank pine flooring.